Cmdr. Raymond Hoffman and Cmdr. 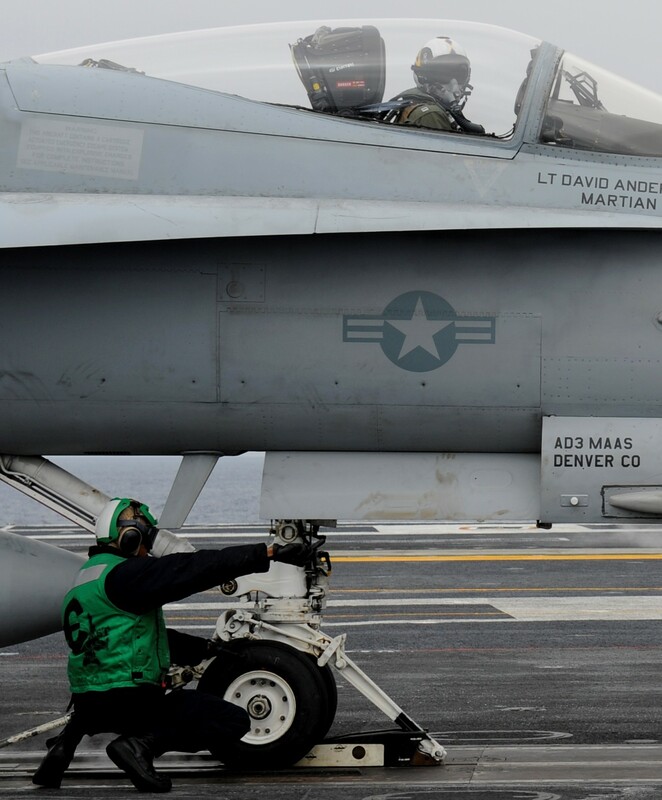 Michael Overson shake hands prior to manning their F/A-18C Hornets for an aerial Change of Command. 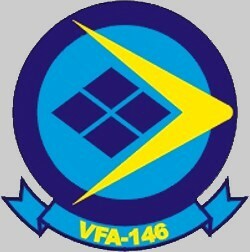 In the spring of 1989, VA-146 was re-designated VFA-146 and transitioned to the multi-role F/A 18C Night Strike Fighter. 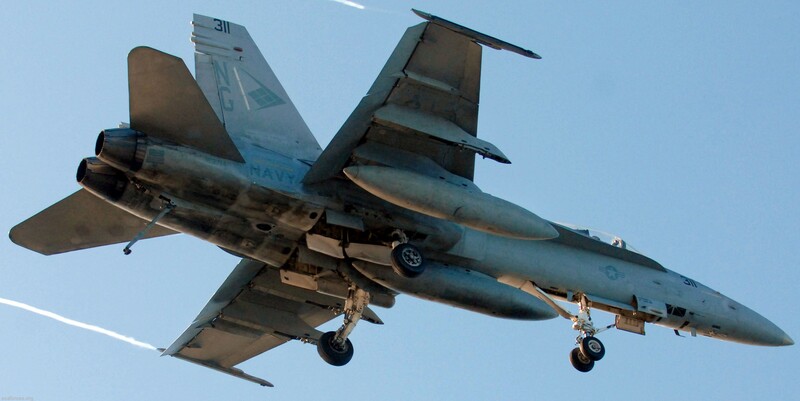 The Blue Diamonds were the first fleet squadron to receive this new version of the Hornet. 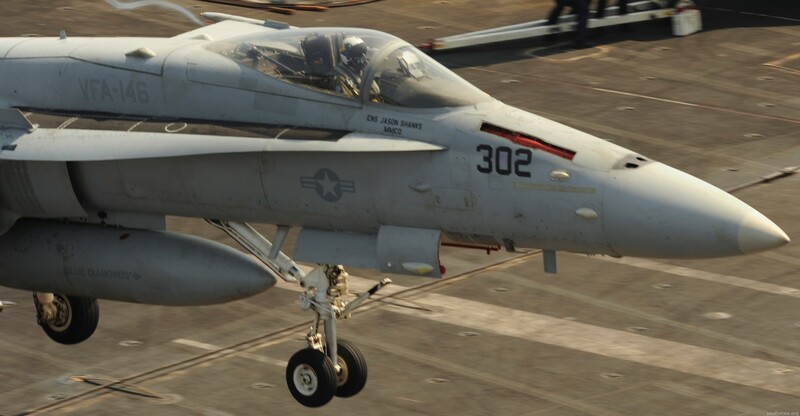 VFA-146 made its first deployment with the Hornet on USS Nimitz (CVN-68) in 1991, arriving on station to participate in the last days of Operation Desert Storm. 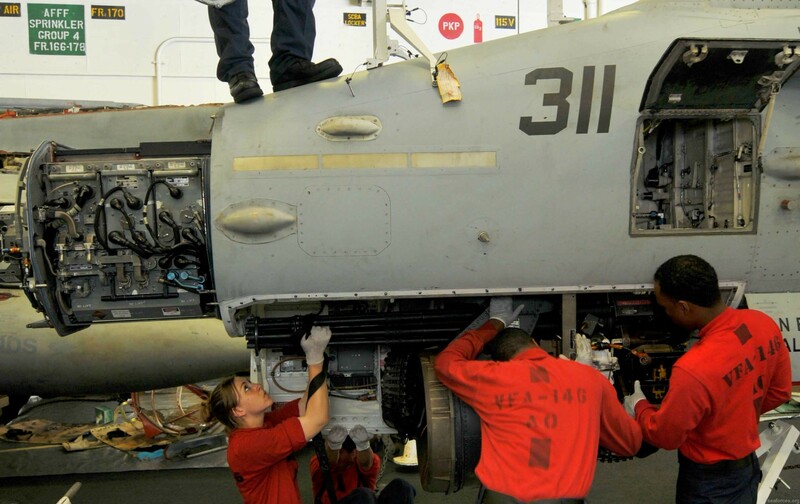 In December 1991, the squadron received the LTJG Bruce Carrier Memorial Award for Excellence in Aviation Maintenance. 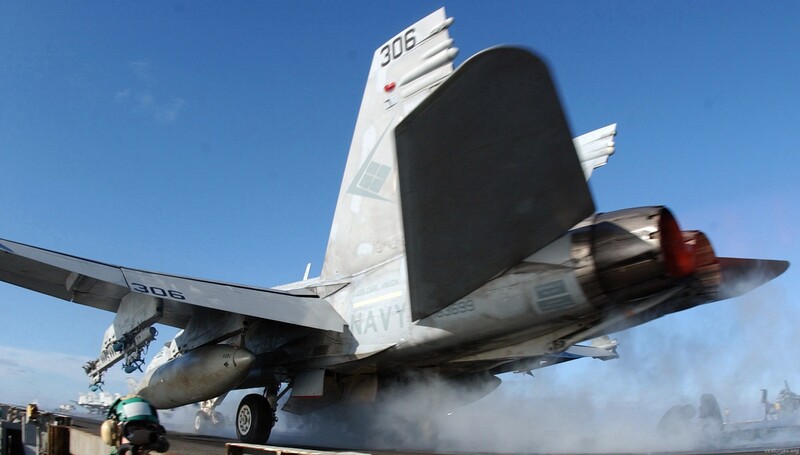 Completing an aggressive turnaround training cycle, they again deployed to the Western Pacific in February 1993. 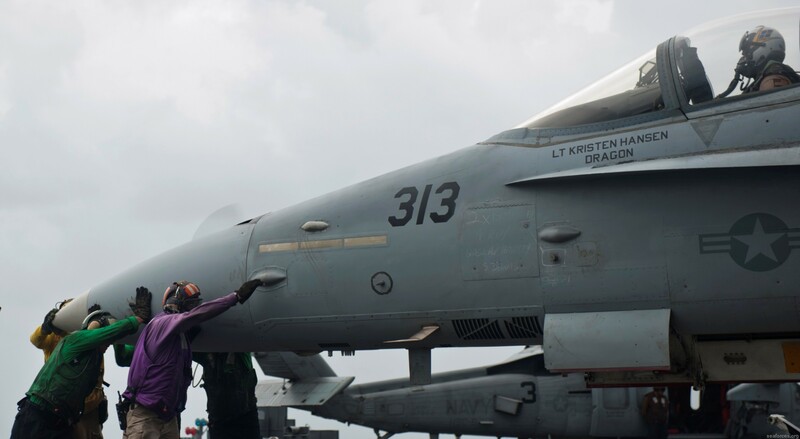 The Diamonds arrived on station in the Arabian Gulf in March and immediately settled into flying missions in support of Operation Southern Watch in Iraq. 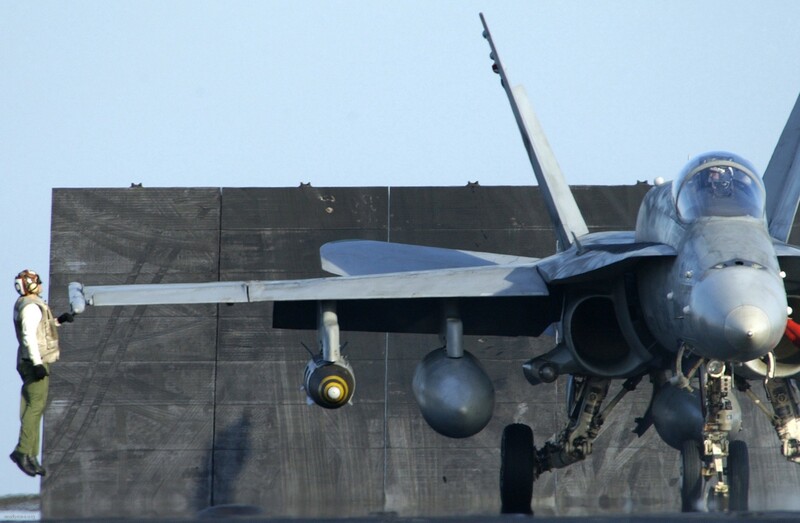 The Nighthawk Laser system was introduced during this deployment increasing the squadron's capabilities by providing autonomous delivery of Laser Guided Bombs. 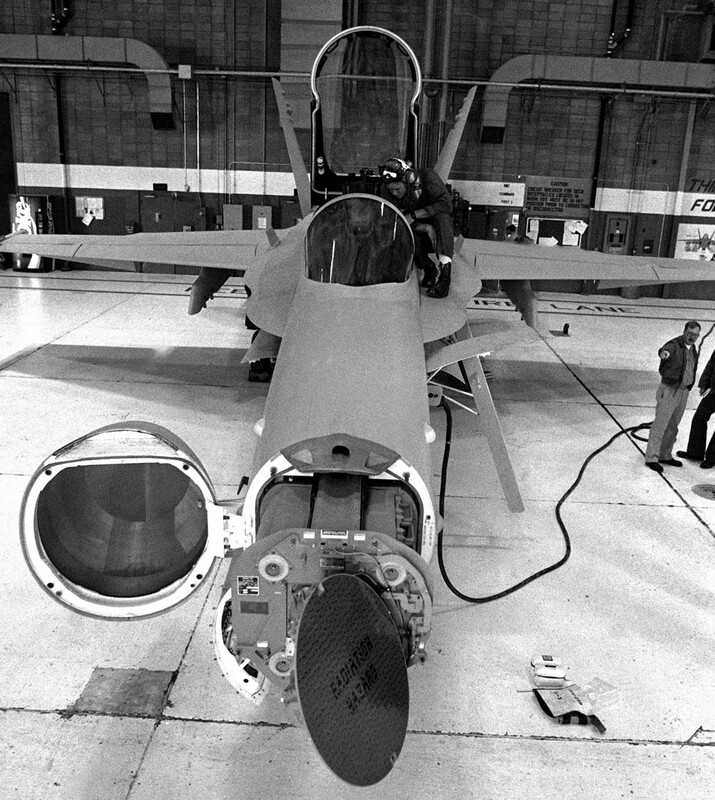 The Diamonds took advantage of the technology and led the fleet in developing tactics for LGB employment. They returned from deployment in July 1993. In September 1993, the squadron won the Bruce McClaran Strike Fighter Derby by posting the best overall and individual scores for the competition. During that same month, the Diamonds flew an unprecedented 60 sorties in a single day to test the surge operations capability of the squadron. The Blue Diamonds completed the year with a "zero/zero" Conventional Weapons Technical Proficiency Inspection (CWTPI). In 1994, the Blue Diamonds were presented a series of awards. Among these were the Scott F. Kirby Ordnance Proficiency Award, the Boola-Boola Award, the Captain Jack McAuley Award, and the Captain Michael Estocin Award. 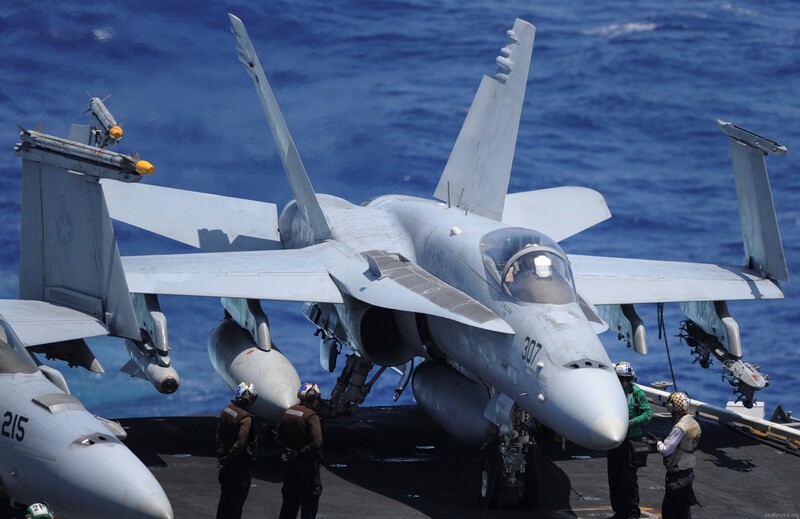 The Blue Diamond's outstanding performance culminated in their selection as the COMNAVAIRPAC Battle Efficiency Award winners for the previous year. The Blue Diamonds next deployment in December 1995, with new airplanes and improved avionics, brought the squadron to both the Arabian Gulf in support of Operation Southern Watch as well as Yankee Station off the coast of Taiwan. In May of 1996, the Diamonds returned to Lemoore and began training for the next deployment while at the same time winning the Boola-Boola Award for the second time in 3 years. 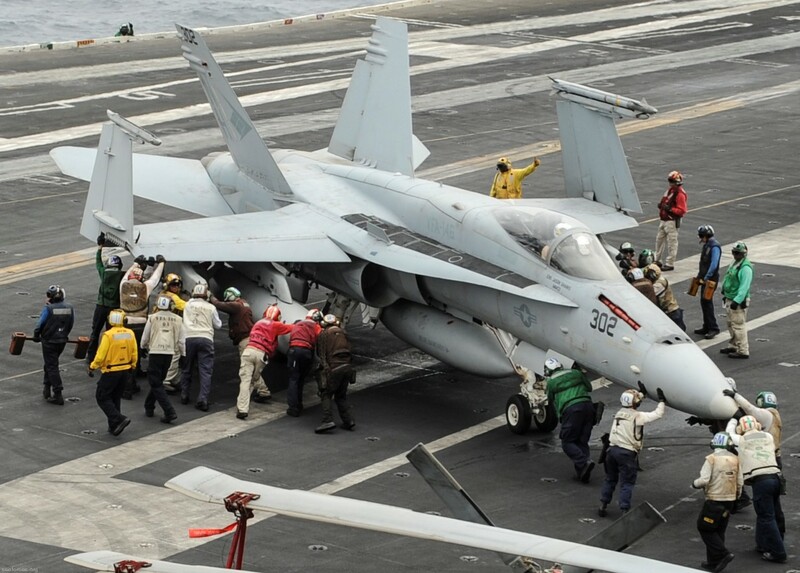 The Blue Diamonds spent the majority of 1997 preparing for a World Cruise on board USS Nimitz (CVN-68), and extended their 13-year history of over 55,000 hours without a Class "A" mishap. The highlight of the work-up cycle was a 96-hour surge operation in which the Diamonds flew 226 sorties. On 4 September 1997, the Blue Diamonds departed San Diego with the Nimitz Battle Group in support of Operation Southern Watch. 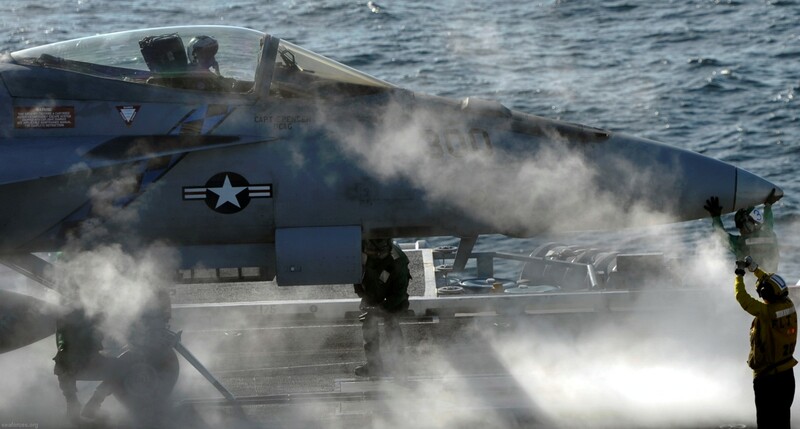 The Battle Group surged to the Arabian Gulf and provided a stabilizing influence to the region at a time of heightened tensions. After four months of supporting Operation Southern Watch, the crisis subsided allowing the Diamonds to return home on time. 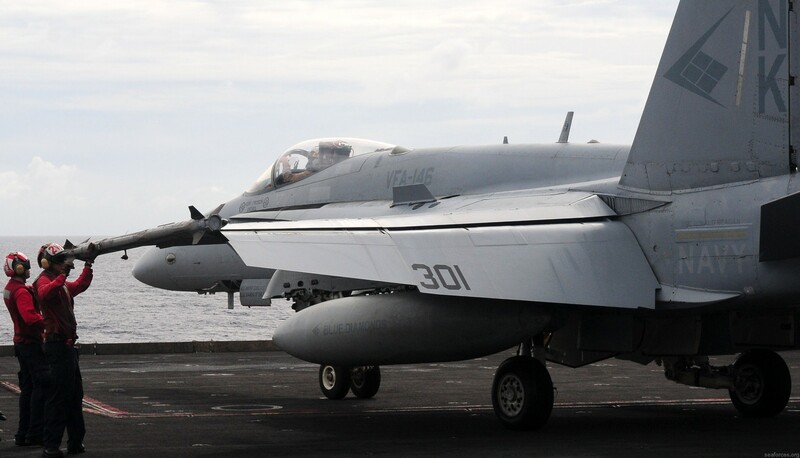 During the deployment, the Blue Diamonds earned the CVW-9 Top Hook Award for the 14th consecutive time and maintained a 99% sortie completion rate while participating in Operation Southern Watch. Shortly after their return to Lemoore, the Blue Diamonds were named the 1997 COMNAVAIRPAC Battle "E" winner. The Diamonds were also awarded the Captain Michael J. Estocin, Rear Admiral Clarence Wade McClusky and the Scott F. Kirby Awards. 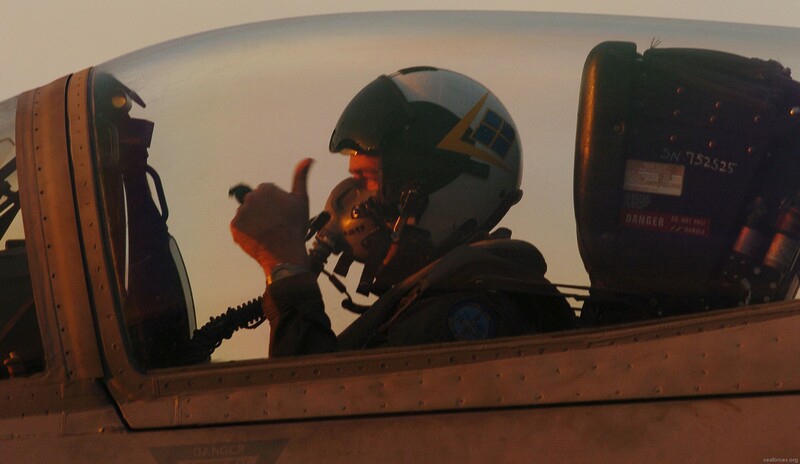 These awards recognize the outstanding efforts of the entire squadron in 1997. 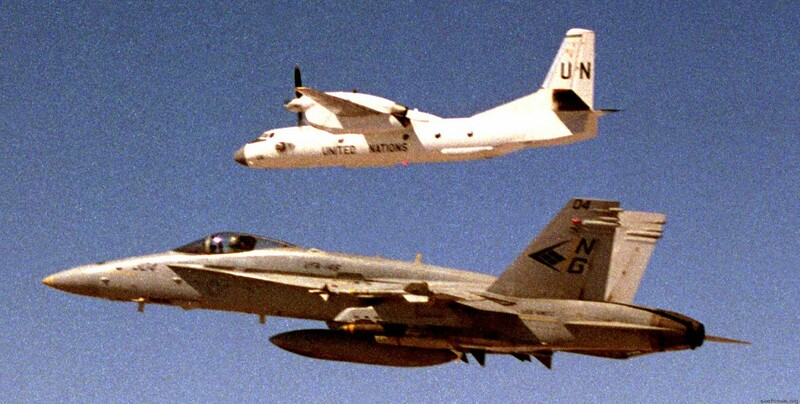 In July 1998, the Diamond's handed over their Lot XVI Hornets for Lot X aircraft. 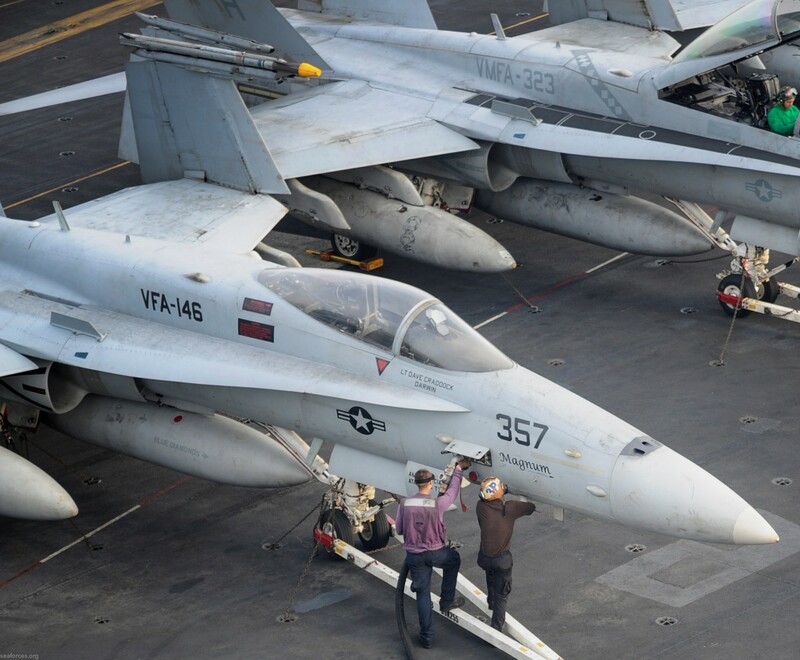 The arduous process began, getting these older Hornets ready for their upcoming cruise onboard the USS John C. Stennis (CVN-74). 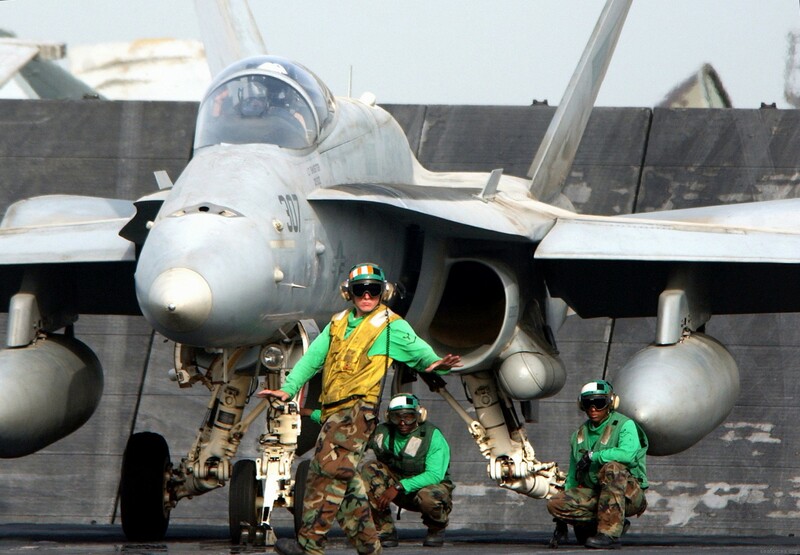 Maintenance efforts were outstanding evident by twelve competent Hornets trapping on the deck of the STENNIS as it pulled out of San Diego on January 7, 2000 in support of Operation Southern Watch. The millennium cruise was a great success. The Blue Diamonds' amassed over 1900 sorties and 2900 flight hours with a phenomenal sortie completion rate of 97%. 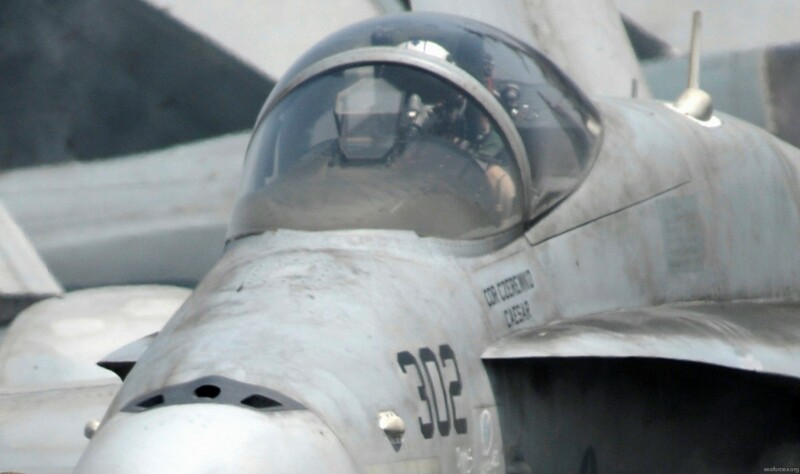 Diamond aviators flew 136 sorties over Iraq destroying several Iraqi targets as a result of precision ordnance delivery. 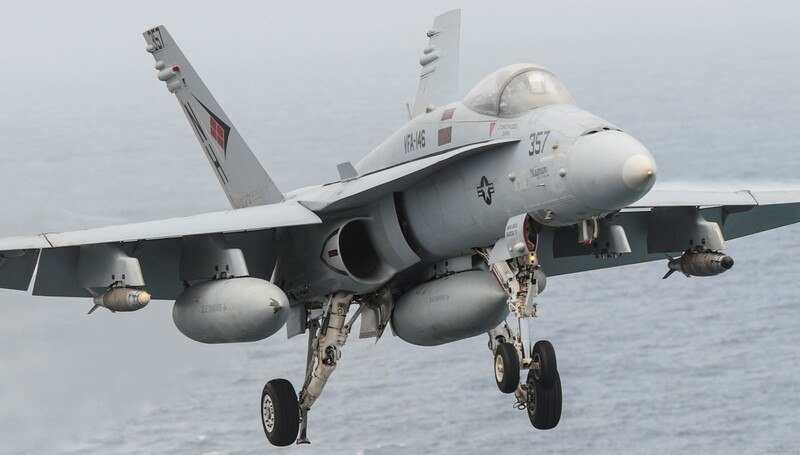 The Diamonds captured the Top Hook award for all three line periods giving an unprecedented 21 consecutive Top Hook awards, a record in Naval Aviation. The Blue Diamonds also received the CINCPAC Pearl Harbor Retention Excellence Award by surpassing all commands in retention rate. 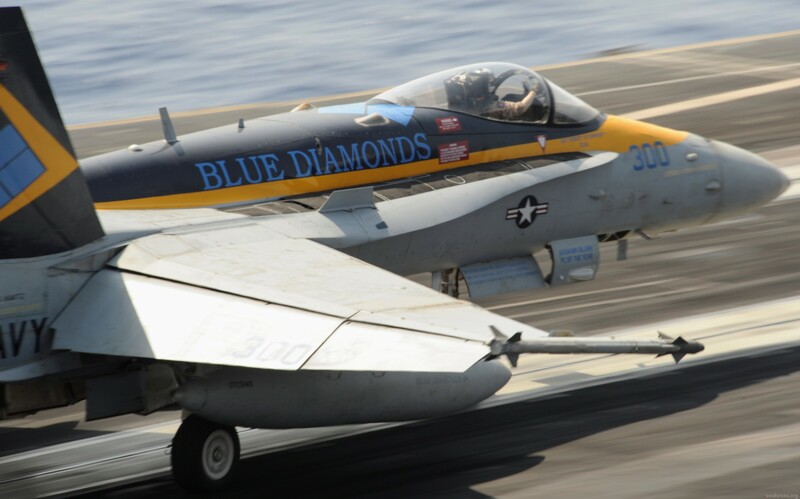 On November 12, 2001 the Blue Diamonds deployed with CVW-9 on the USS John C. Stennis (CVN-74). 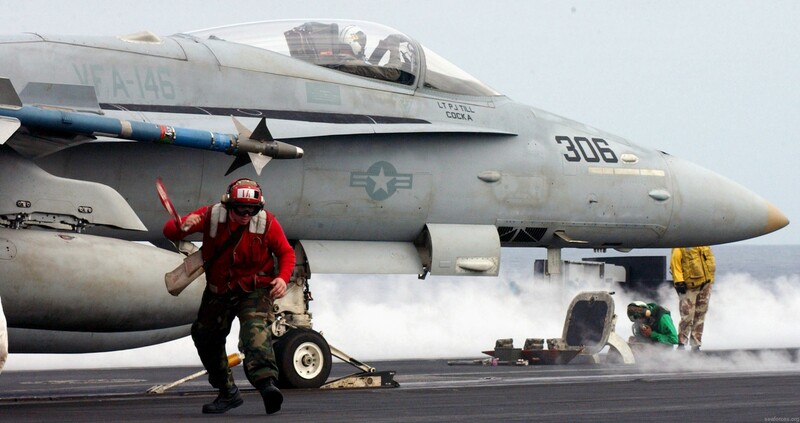 This time to conduct combat operations in support of Operation Enduring Freedom over Afghanistan. The Diamonds deployed two months early in response to the terrorist attacks on September 11, 2001. Port calls on the way included Hong Kong and Singapore arriving in the North Arabian Sea. On December 12, 2001 the Blue Diamonds began their first night strikes into Afghanistan. 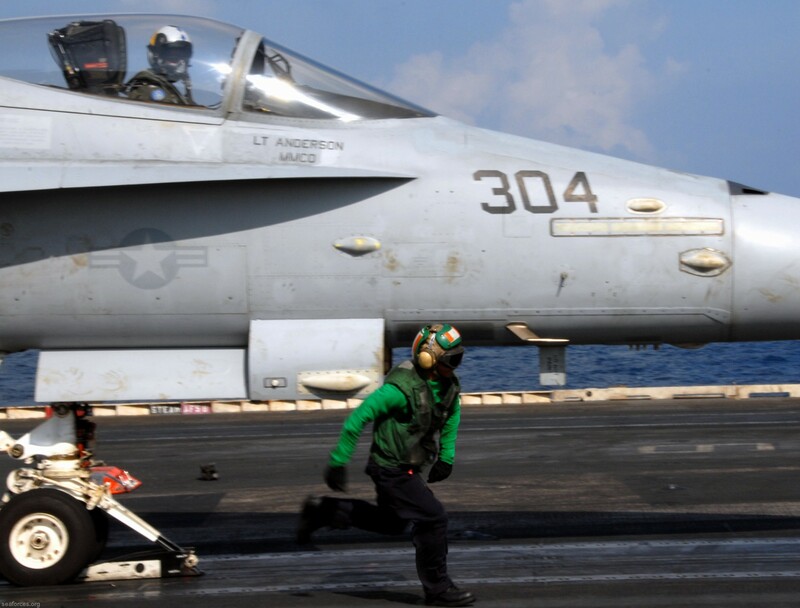 The missions ranged from 4.5 to 6.0 hours with help from the Roosevelt Battle Group and the Kennedy Battle Group. 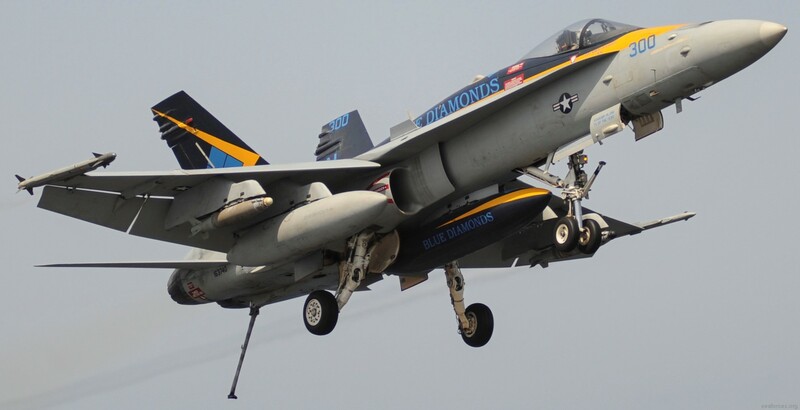 The Blue Diamonds amassed over 3500 flight hours and delivering over 102,000 pounds of ordnance. Milestones included extending their Top Hook Award streak to 24 after the first line period. 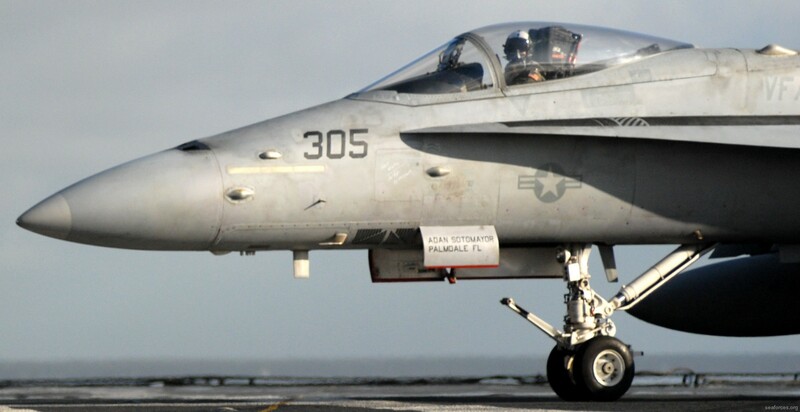 Weapons included the JDAM, Laser Guided Bombs, and Mk- 82's. The Diamonds returned at the end of May 2002 after a stopover in Australia and a Tiger Cruise from Hawaii. 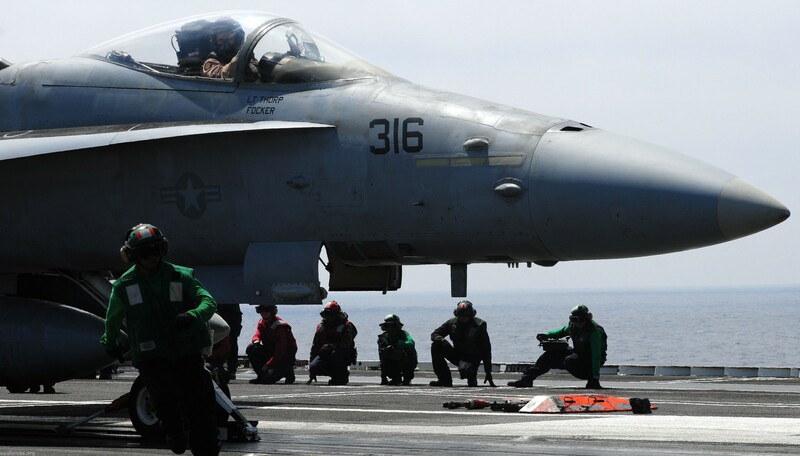 After a brief 3-month interim, a new, compressed workup cycle began in response to heightening tensions with Iraq. 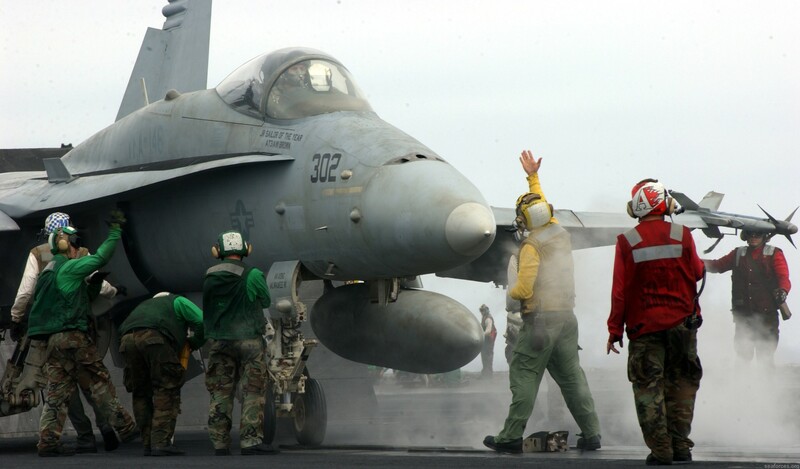 VFA-146 began their 27th deployment aboard the USS Carl Vinson (CVN-70) on January 15, 2003. 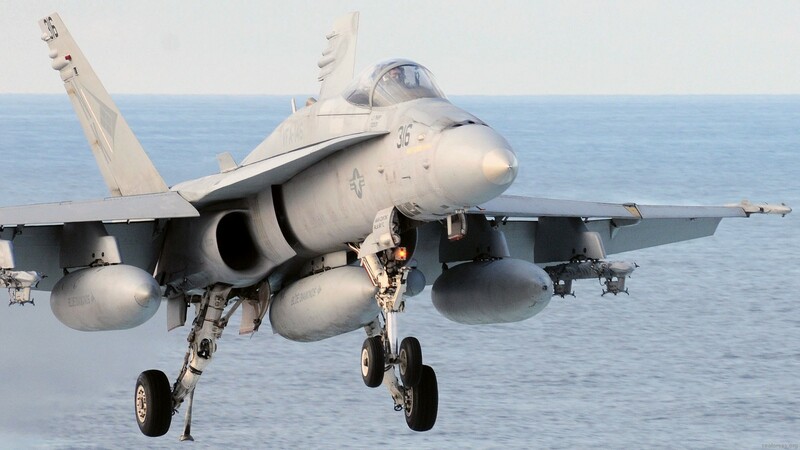 The Blue Diamonds and the CAG-9 team were not tasked with supporting Operation Iraqi Freedom but were attached to 7th fleet in the sea of Japan as a power projection asset. It was the first "traditional" Westpac for the Blue Diamonds in several years including port calls in Guam, Japan, Hong Kong, Singapore, Perth and South Korea. All in all the deployment lasted 8 months to the day, getting our sailors home on September 17 for a brief interim period over the holidays. 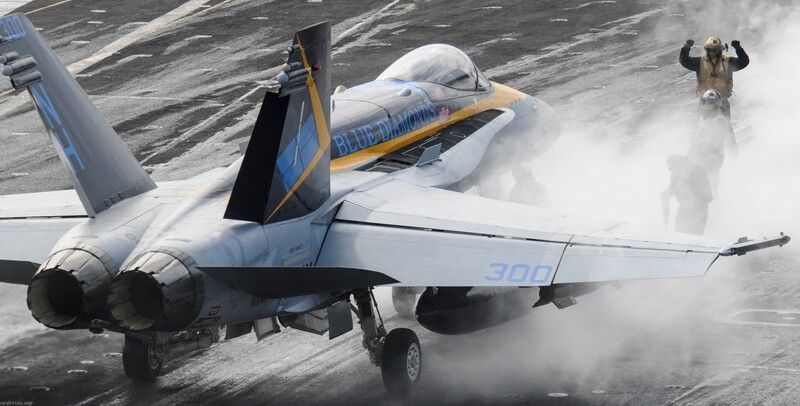 The Blue Diamonds spent the first half of 2004 maintaining readiness as part of the Fleet Response Plan (FRP) and then started another workup cycle to prepare for their 28th deployment. 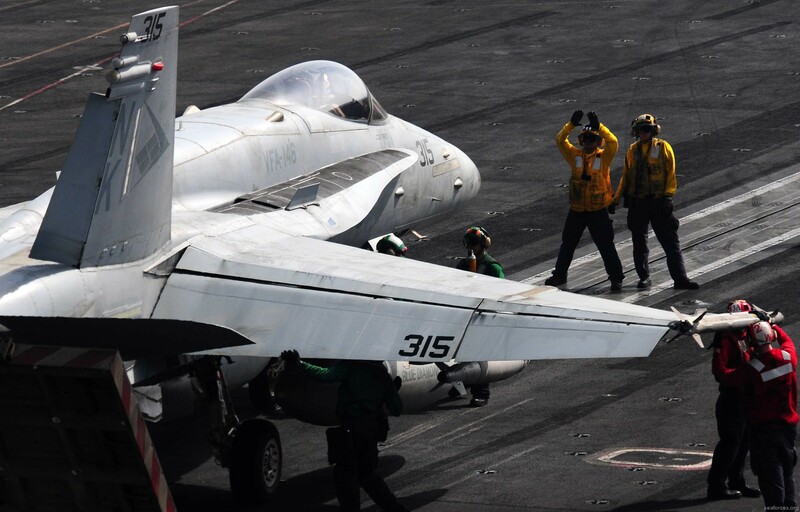 The Diamonds began another cruise aboard USS Carl Vinson on January 17, 2005. 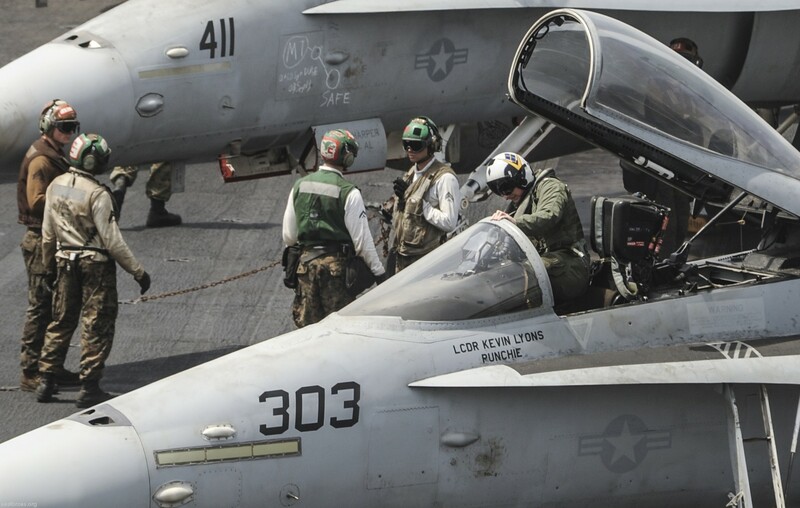 The "around-the-world" deployment took them across the Pacific and Indian Oceans into the Persian Gulf. 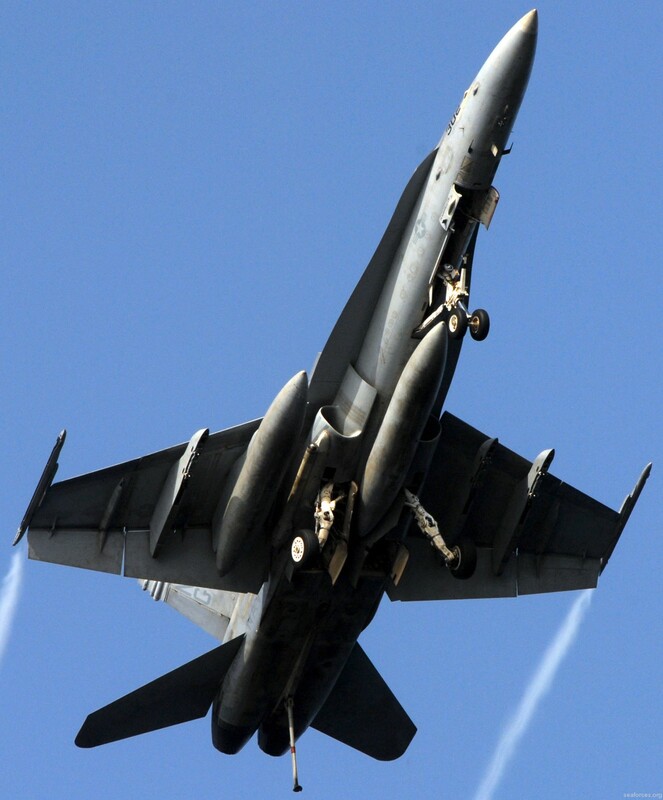 For three months the Blue Diamonds, along with the rest of Carrier Air Wing 9, flew missions in support of Operation Iraqi Freedom. 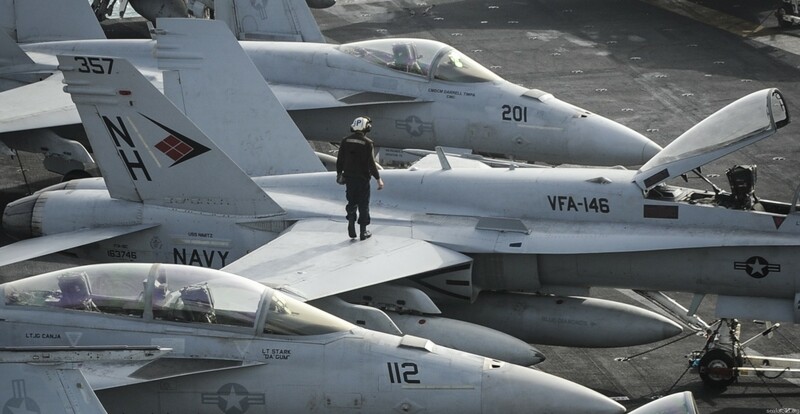 The Vinson then turned south to steam around the Sinai Peninsula into the Red Sea, through the Suez Canal, the Mediterranean Sea, then across the Atlantic. On July 31, 2005, the Vinson pulled into its new homeport of Norfolk, VA completing another successful deployment for the Blue Diamond team. 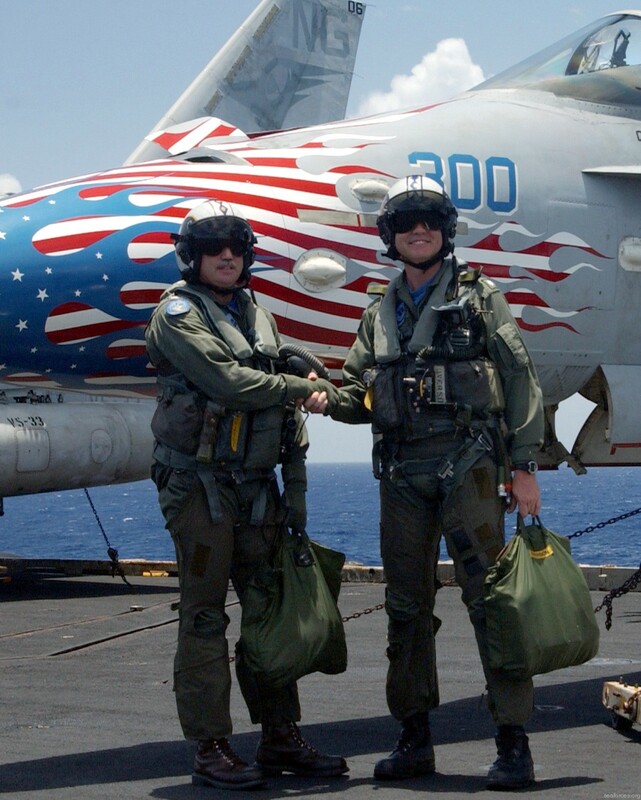 On January 18th, 2007 the Blue Diamonds deployed again onboard USS John C Stennis (CVN-74). 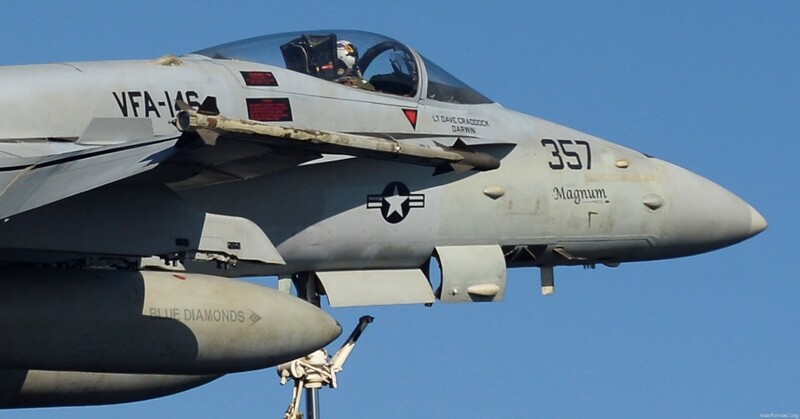 For the next six months, the Diamonds flew combat missions in support of Operation Enduring Freedom and Operation Iraqi Freedom. 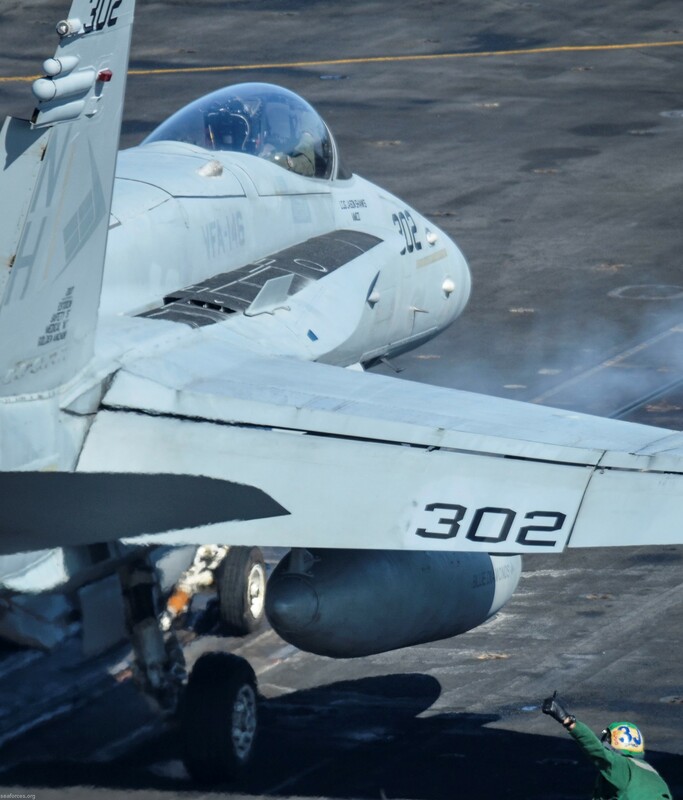 The squadron reached an incredible milestone of 22 consecutive years with no Class A mishaps, extending their outstanding safety record to more than 92,000 mishap-free flight hours. 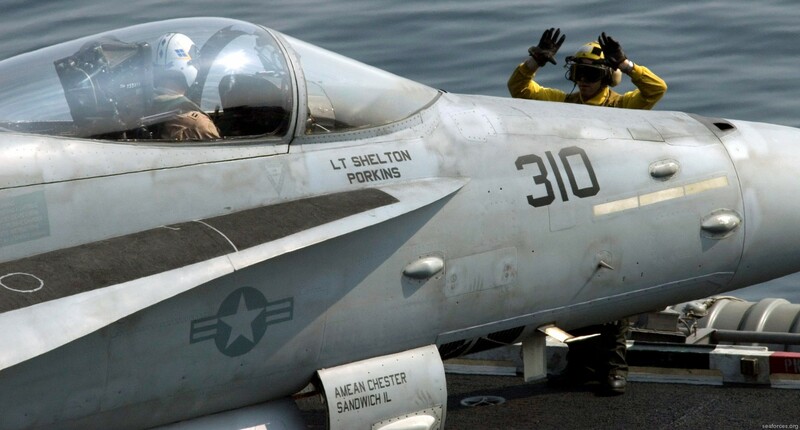 Additionally, VFA-146 flew more than 400 combat sorties, encompassing over 2,500 flight hours during a highly dynamic deployment. 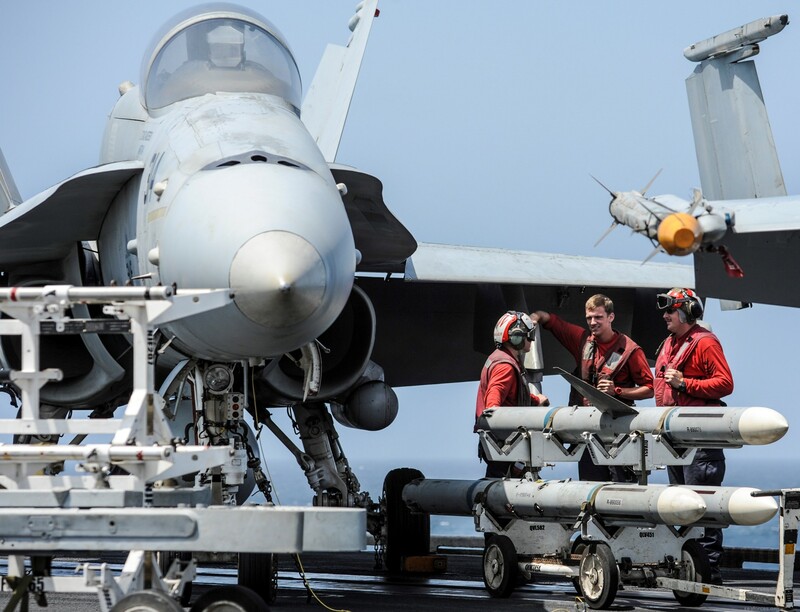 Exceptional maintenance support led to the squadron’s extraordinary combat performance in achieving a weapons effectiveness rate of 95% while delivering more than 23,000 pounds of ordnance and over 5,000 rounds of 20mm in support of Coalition Forces. The command’s attention to detail and tremendous pride were integral to daily operations, and resulted in the Blue Diamonds earning the CVW-9 “Golden Wrench Award” for maintenance excellence during the 2007 deployment. 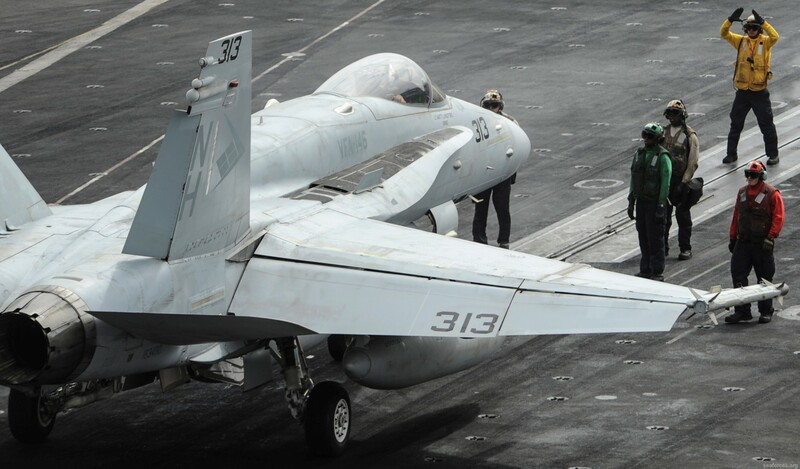 On the return home, the Blue Diamonds participated in Valiant Shield - a three carrier exercise off the coast of Guam. Soon after, the Stennis pulled into Hawaii to pick up family and friends for the Tiger Cruise and make the final push towards home. On August 27th, after seven and a half months out to sea, the Stennis pulled into San Diego ending yet another successful deployment for the Blue Diamonds. After enjoying some much needed time off for the holidays, the Blue Diamonds hit the ground running for the start of another work up cycle. In February, 2008 the Diamonds traveled to Key West to prepare for the upcoming SFARP in the months of March and April. Once again the Diamonds shined with superior performance and maintenance completing both SFARP Fallon and their first boat detachment TSTA. The Blue Diamonds are currently ramping up for a return visit to Fallon for the next phase of work ups – Air Wing Fallon. On January 17, 2009, the Blue Diamonds embarked on the USS STENNIS for the beginning of their WESTPAC. 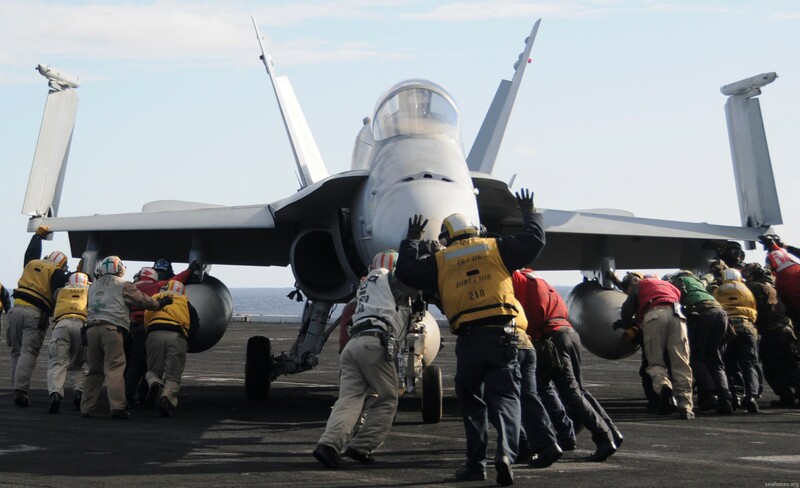 The Carrier Strike Group THREE and Carrier Air Wing NINE team helped reinforce foreign diplomacy and international relations by participating in Exercise Foal Eagle off the coast of Korea. On their return home, the Blue Diamonds pulled into Hawaii before steaming north to participate in Northern Edge off the coast of Alaska with the United States Air Force. 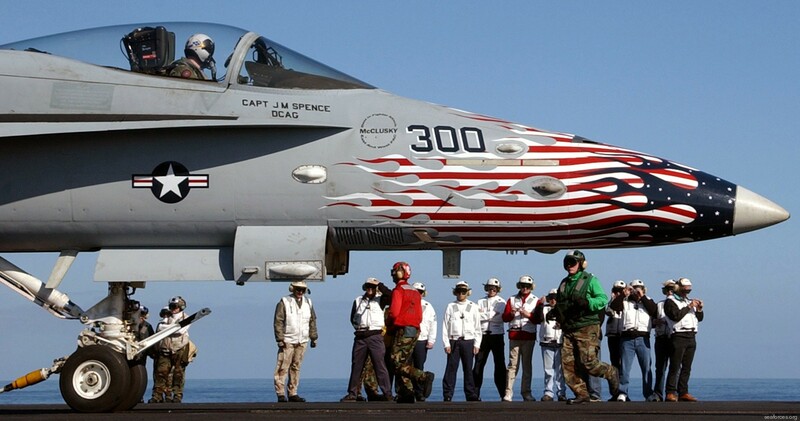 On July 6th, 2009, the USS STENNIS pulled into Sand Diego marking the end of an era onboard the USS STENNIS. 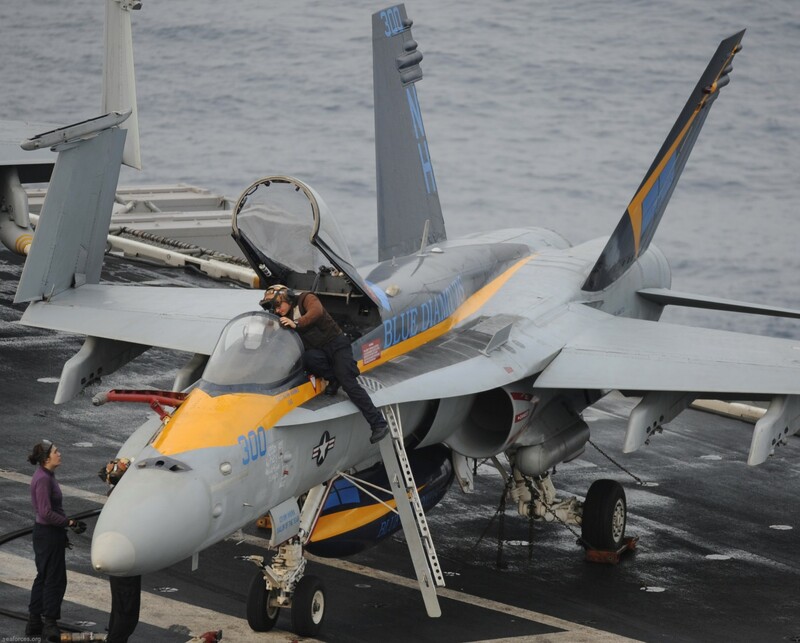 Before departing CVW NINE, the Blue Diamonds earned the 2009 Bruce Carrier Award for maintenance excellence. 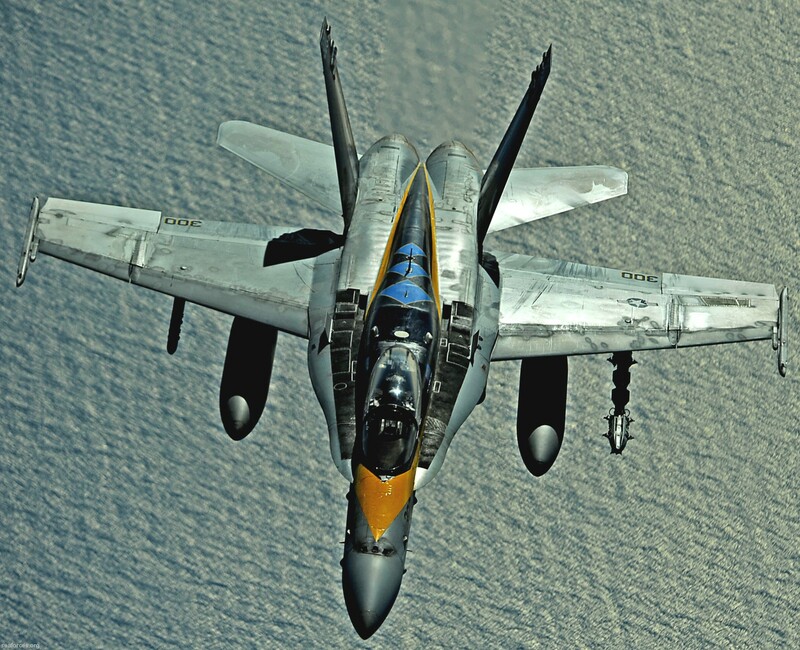 In April 2010, the Blue Diamonds transitioned to the Carrier Air Wing FOURTEEN team. Again, the Blue Diamonds were awarded the 2010 Bruce Carrier Maintenance Award. 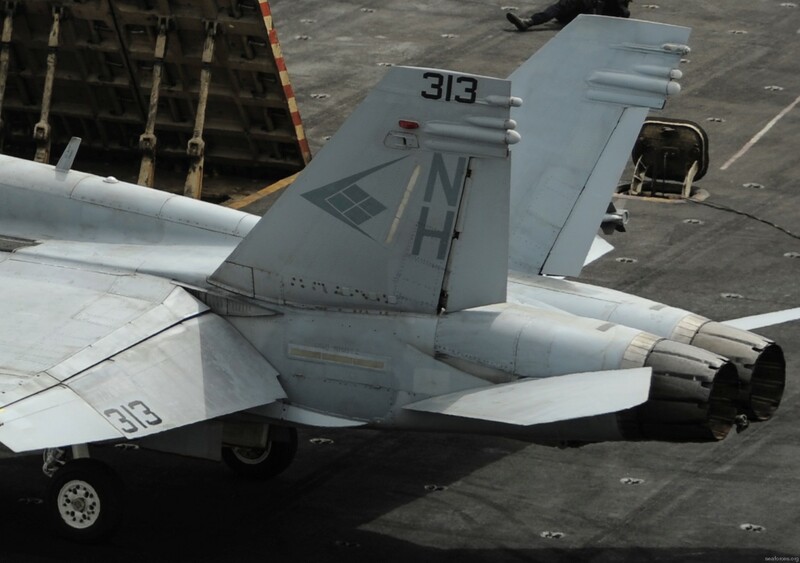 On 2 February 2011, the Blue Diamonds deployed onboard the USS RONALD REAGAN (CVN-76). During a seven month deployment, the Blue Diamonds participated in Operations TOMODACHI, providing over 336,000 pounds of vital supplies for over 34,000 displaced Japanese citizens during humanitarian relief efforts. The Blue Diamonds then headed west, and flew 212 combat sorties in support of Operations NEW DAWN and ENDURING FREEDOM. 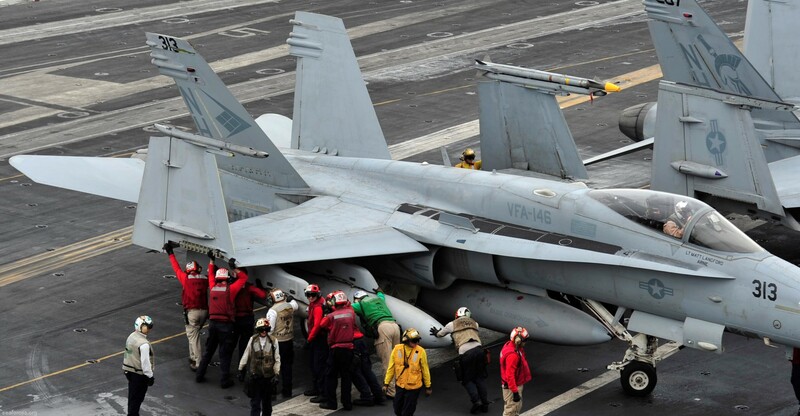 The USS RONALD REAGAN (CVN-76) and the Blue Diamonds returned home on 9 September 2011. Upon returning from deployment, the Blue Diamonds had about a month at home before again going to support sustainment training tasked by Third Fleet. This operation lasted on month before the Blue Diamonds returned home again in early November. 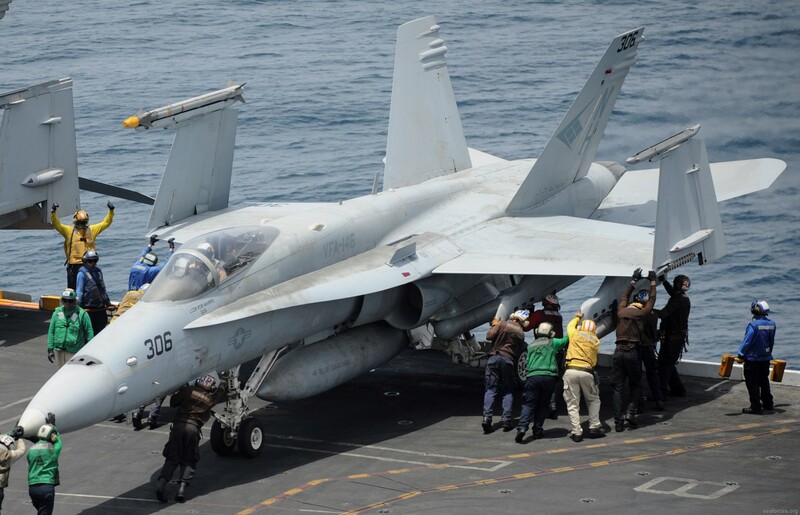 In December 2011, VFA-146 joined the CARRIER AIR GROUP ELEVEN and USS NIMITZ (CVN-68) team, and began work-ups for their next deployment. 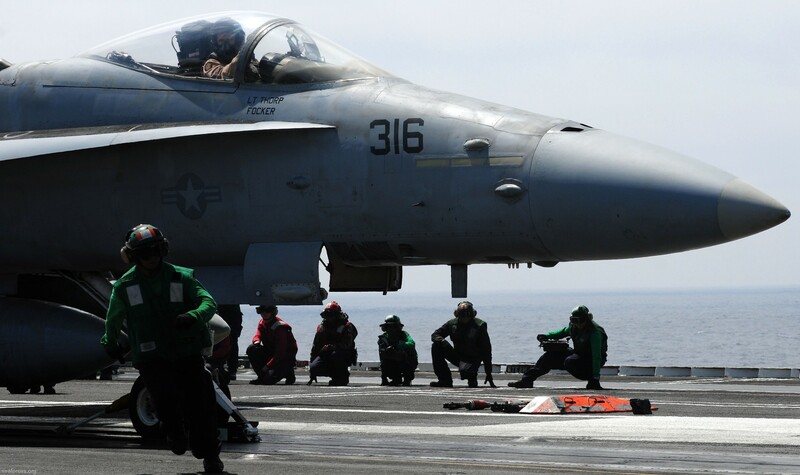 In addition to the normal work-up cycle, the Blue Diamonds embarked on the USS NIMITZ from June to August 2012 while participating in the 2012 Rim of the Pacific International Exercise. 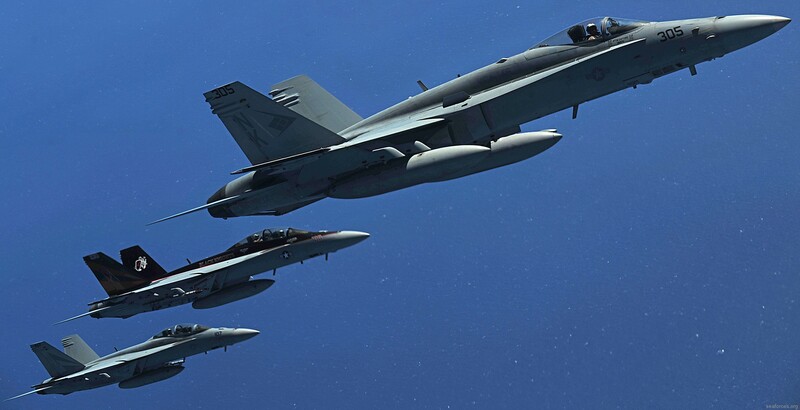 Soon after returning from the Pacific, VFA-146 and CARRIER AIR GROUP ELEVEN headed to Fallon, Nevada to participate in 4-week Air Wing Fallon exercise. 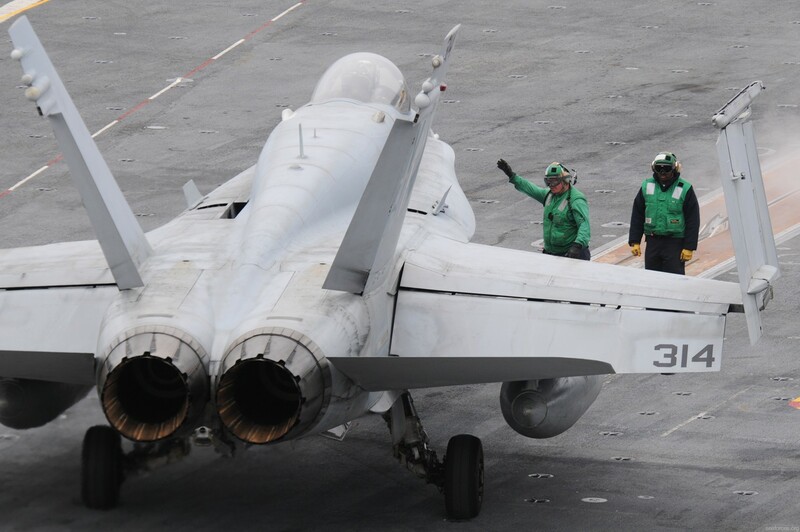 As part of the normal work up cycle, the Blue Diamond team returned back to the USS NIMITZ in October 2012 to November 2012 for Composite Training Unit Exercise (COMPTUEX)/Joint Task Force Exercise (JTFEX). 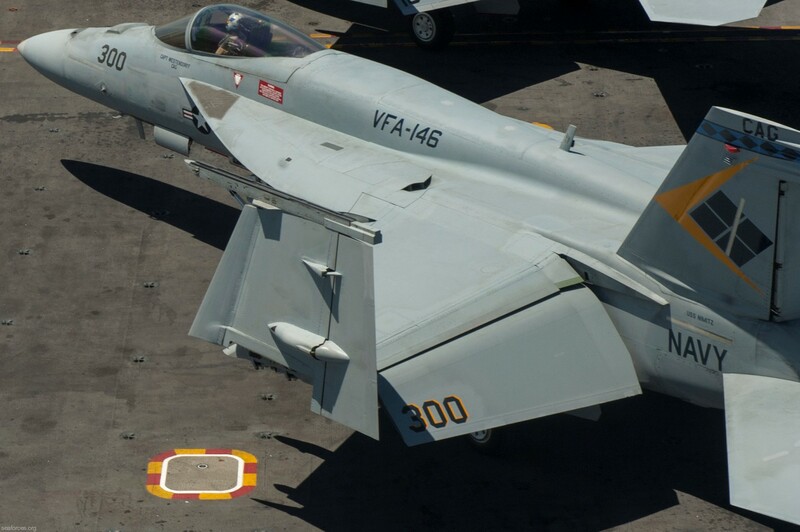 VFA-146 and Carrier Air Wing ELEVEN deployed on board USS NIMITZ (CVN 68) in April 2013. 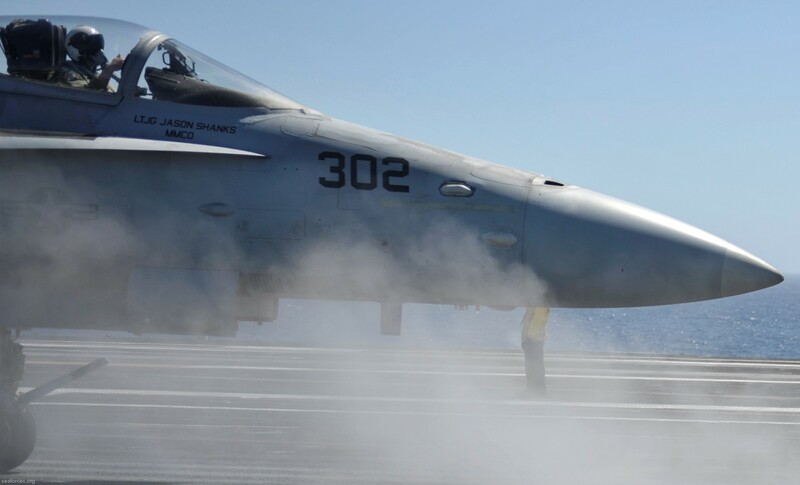 While deployed, the Blue Diamonds conducted operations in the 5th, 6th, and 7th Fleet AORs. 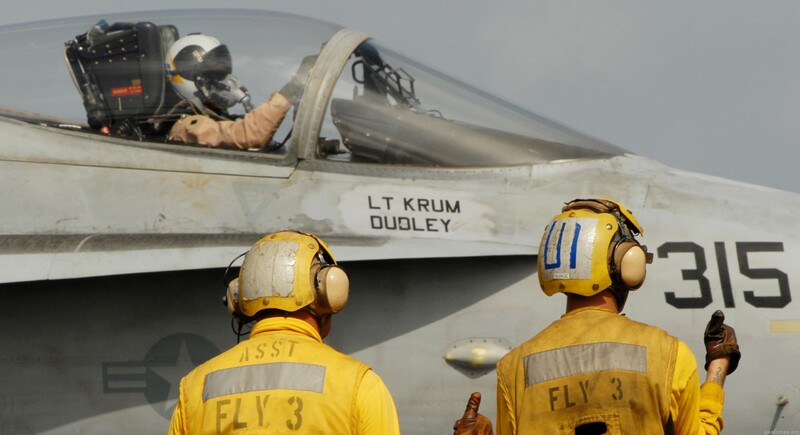 They flew combat missions in support of Operation ENDURING FREEDOM and extended on station in response to the Syrian Crisis. Additionally, the Diamonds participated in multinational exercises with South Korea, Japan, France, and Great Britain. 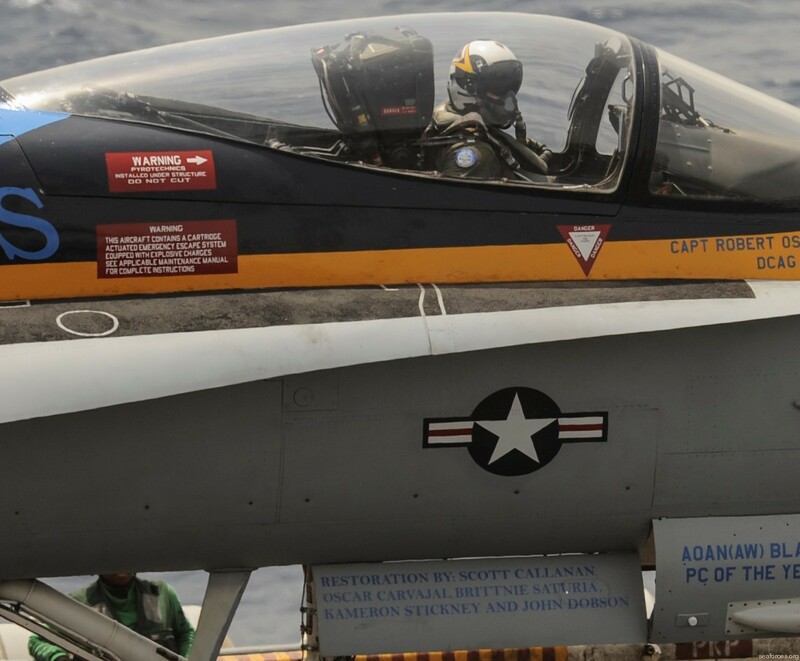 The Blue Diamonds returned home from deployment in December of 2013 and were subsequently awarded the 2013 Chief of Naval Operations Battle E and CAPT Michael J. Estocin Award for exceptional operational performance as well as the Aviation Safety Award. 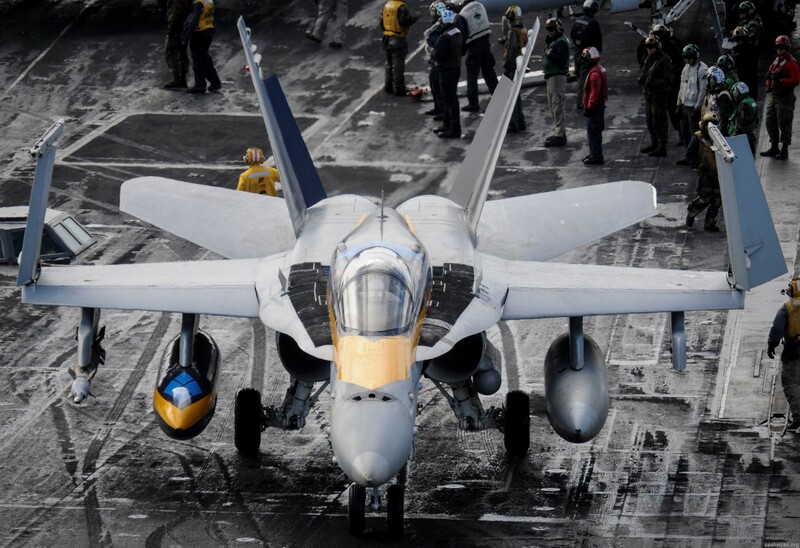 Since returning from deployment VFA-146 underwent an extensive maintenance phase to transfer 14 Lot X F/A-18C Hornets to other squadrons and Aerospace Maintenance and Regeneration Group (AMARG). 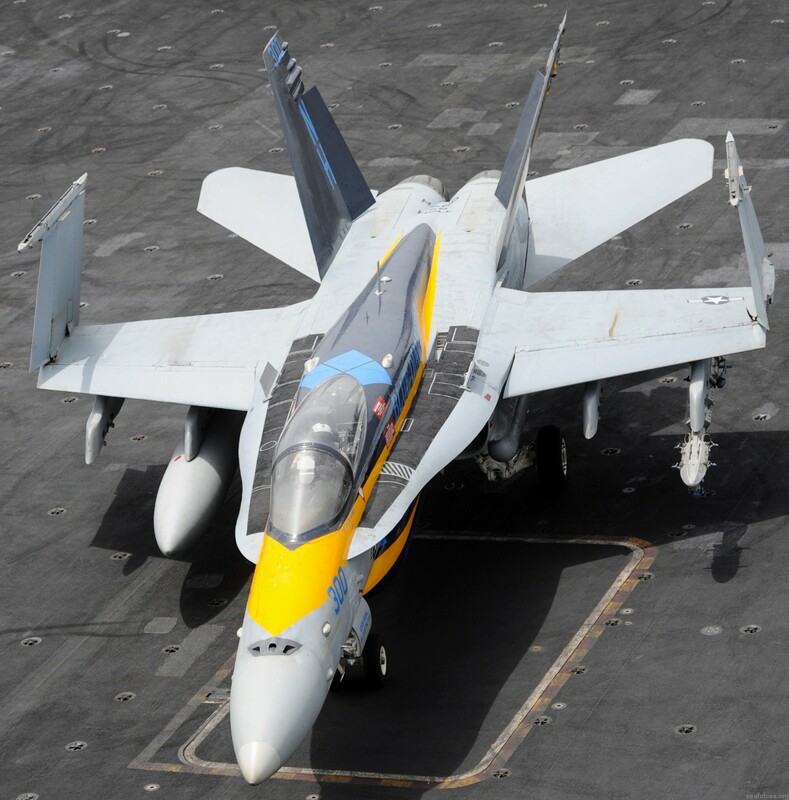 From December 2014 to May 2015 the Blue Diamonds transitioned from Lot X Hornets to Lot 24 F/A-18 Super Hornets. 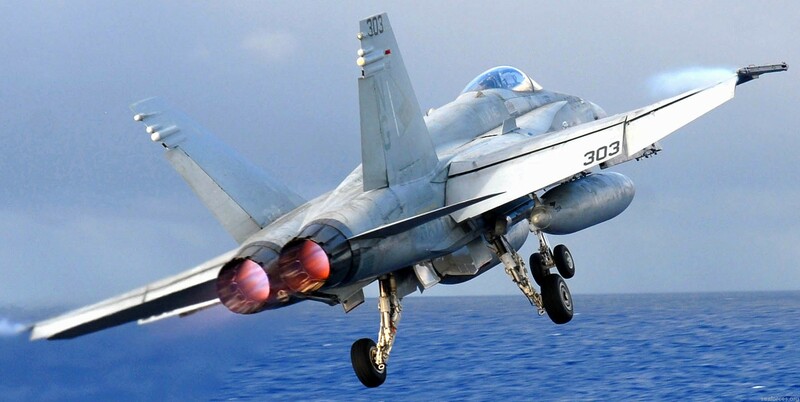 On 26 May 2015 the Blue Diamonds achieved their Safe-for-Flight qualification in the Super Hornet. 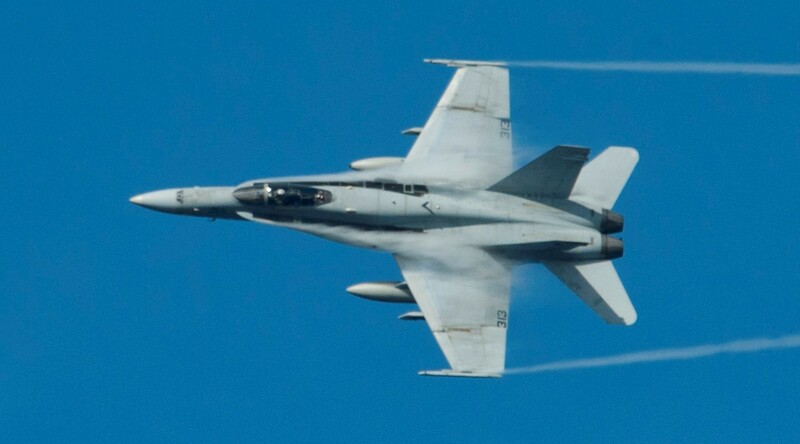 Since then, the Blue Diamonds tested some of the new systems and capabilities of the Super Hornet, executing live missile shoots with Carrier Air Wing Eleven during multiple detachments. 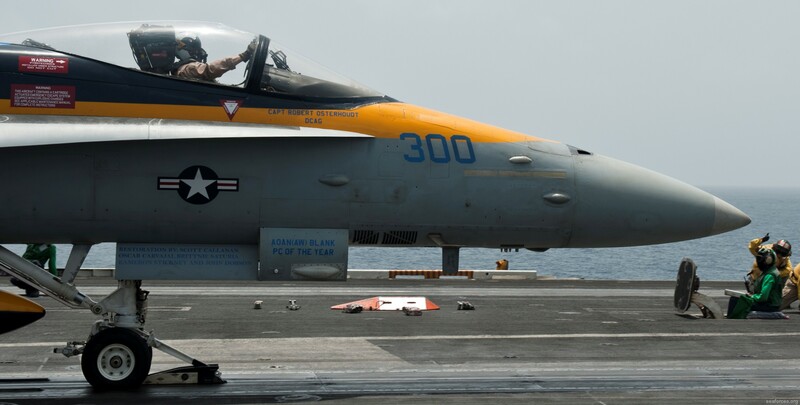 Starting the in the summer of 2016, the Blue Diamonds began the work-up cycle in preparation for their 2017 Combat deployment completing Strike Fighter Advanced Readiness Program, Carrier Qualification on board USS NIMITZ, Tailored Ships Training Assessment, Air Wing Fallon and Carrier Composite exercise. 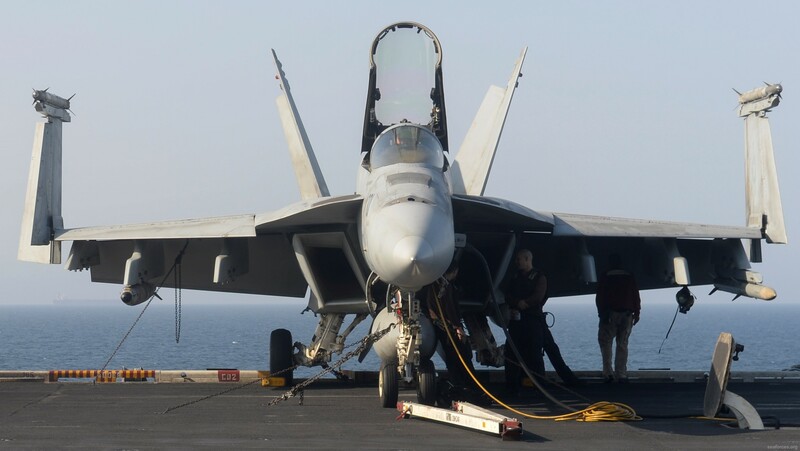 Additionally the Blue Diamonds ended the Fiscal year earning the CNO’s Medical Blue “M” and the Carrier Air Wing Eleven “Golden Wrench” Award. 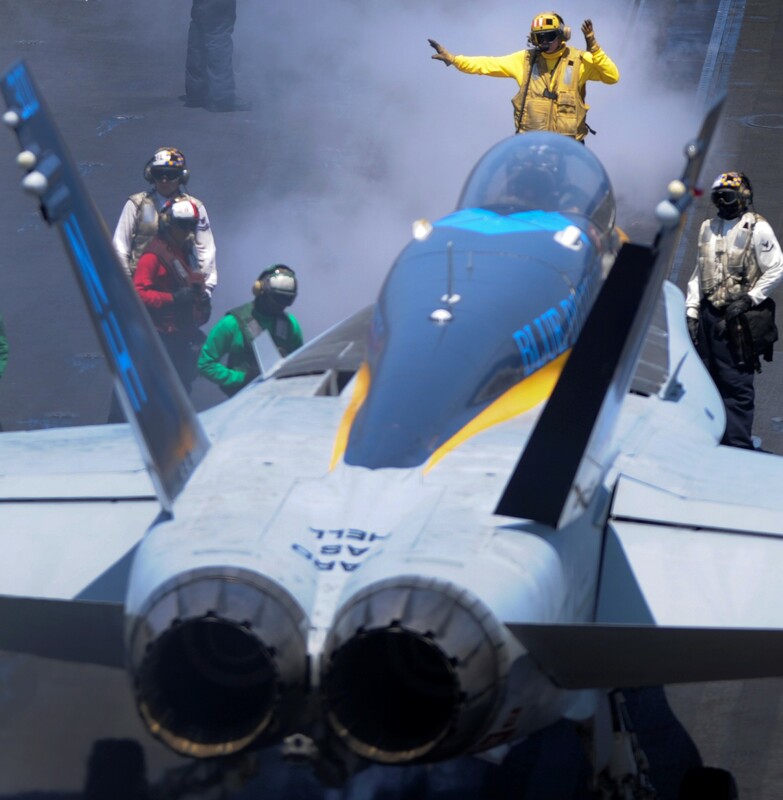 In June of 2017 the Blue Diamonds embarked on board USS NIMITZ for the 2017 Western Pacific Deployment. 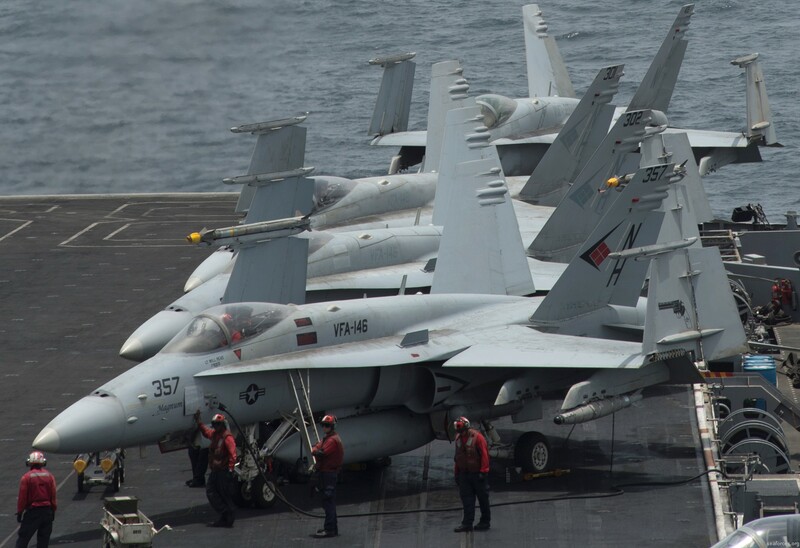 During deployment, the NIMITZ Strike Group participated in Joint Exercise Malabar and in the historic Tri-Carrier operations with USS RONALD REAGAN and USS THEODORE ROOSEVELT within the Seventh Fleet Area of Operations. 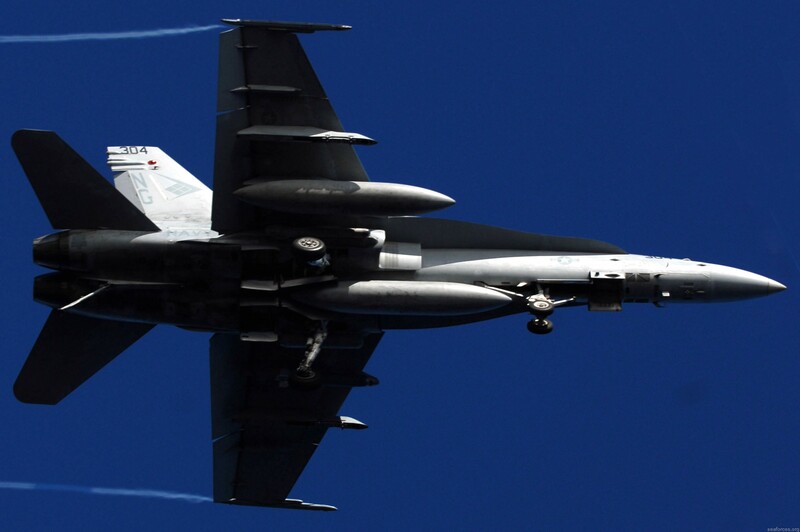 Both the Japanese Self Defense Force and Republic of Korea Navy participated. 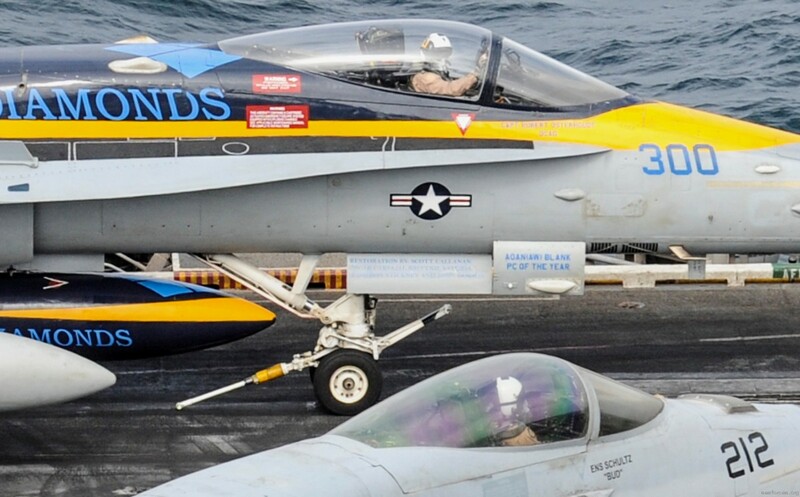 Additionally the Blue Diamonds participated in Operation Inherent Resolve within the Fifth Fleet Area of Operations. Since the BLUE DIAMONDS' return from deployment, the squadron has entered its maintenance phase in preparation for the 2018 Fleet Response Training Plan and subsequent deployment.